Most of us know anecdotally that print media on occasion present immunisation information incorrectly, but you can’t put a finger on how often and when without hard numbers. A recent research article examining New Zealand newspapers puts numbers to the errors. Helen Petousis-Harris led a team surveying the immunisation statements in articles printed in four national New Zealand newspapers over 6 years (2002-2007). They find that the proportion of unsubstantiated statements about the meningococcal immunisation programme increased with increased public interest and fell again as interest waned. Most media ‘balance’ given to immunisation relies on ‘he said, she said’ arguments using quotes from opposing spokespersons with a failure to verify the scientific validity of both the material and the source. It’s tempting to think that what is happening is that as public interest increases some journalists and editors increasingly ’present the other side’–which is not a necessarily appropriate thing to do–rather more thoroughly assess and critique the arguments presented by those interviewed. A problem with ‘he said, she said’ is that in matters of fact it is not people’s opinions that matter, but the strength of the evidence backing the statement that matters. Considerable space in the article is devoted to discussing errors of fact and logic, concisely introducing the errors examined. In addition to introducing the types of errors, examples are given, with sources cited. These ‘worked examples’ would be an excellent aid to help those writing the articles gain a ‘feel’ for what to be alert to. Their survey is based on a database of articles derived from a commercial media watch service containing words associated with vaccines and vaccine-preventable disease. They consider both errors of fact and errors of logic under a taxonomy of errors, which are identified, marked** and the number of lines of each category in the article counted. Errors in statements both favouring vaccination and against vaccination are considered as errors; what is being assessed is accuracy of the statement, not the viewpoint of the statement. If you want to check these twitter accounts for yourself, enter http://twitter.com/#!/ followed by the twitter name, skeeve37, hanneloreec, etc. * I don’t know if these differences are statistically significant. ** You might argue that they ought to have counted the number of statements, rather than the number of lines in scoring the articles. It seems to me that this would depend on your objective. If the idea is to assess how much ‘space’ is spend in different states (correct or fallacious in various ways) in the article then counting lines seems reasonable, assuming all lines are of the same length as they typically are in print newspaper articles. This would cover if the writer spend more space emphasising a particular aspect compared to others, something counting the number of statements might overlook. 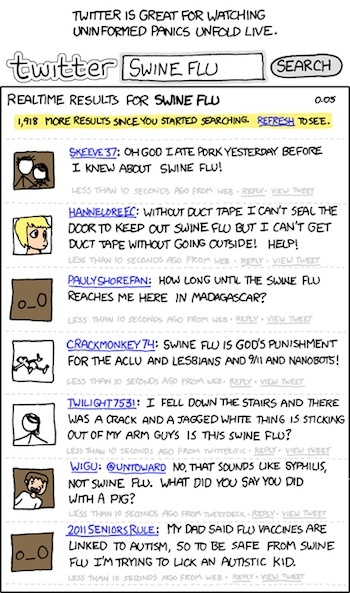 each of the twitter accounts in the cartoon can be found on twitter. It’s just like xkcd to do that, eh? While I’m writing, I’m ruminating that I should have emboldened the paragraph immediately above the cartoon to highlight itâ€™s message. What needs to be readâ€”in my opinion!â€”is the discussion and examples of errors in the article itself, which my brief summary doesn’t really touch on at all. My summary really only touches on the overall improvement needed, not the individual errors needed to be recognised and challenged in order to make that improvement. Itâ€™d be similar to giving someone a goal without an outline of the means to achieve it. In other words, the paper introduces a bias in its definition… it assumes that “evidence-based medical literature” de jour is fact when in fact much of it suffers from publication bias and massaged results. It is patently clear from the natural decline of meningococcal disease and deaths that was well in hand PRIOR to the rollout of the MeNZB vaccine that the vaccine could never have been the cause of the ongoing decline in the disease. A fact unpublished in the scientific literature is that in the years 2006-2009 the ONLY deaths in children who were entitled to be vaccinated with MeNZB were children who received the vaccine. NONE of the deaths were of children whose parents rejected the vaccine for whatever reason. broadly based in Aristotleâ€™s classifications could have been used to conclude the comments made about me personally? I have been a practicing risk and policy analyst/adviser for over a decade… In 2000 the Ministry of Health appointed me to an expert working group to advise the DG of Health on the management and reporting of medical injury in the health system; the appointment was recognition of my risk analysis experience and skills. the development of antibiotics is also false… they should have provided a reference to support their fallacy… much of the decline had occurred PRIOR to the introduction of antibiotics… here’s a link to one of many paper proving that. The paper is factually flawed. The media in general are guilty of accepting anything an “expert” says without fact-checking it, and the Science Media Centre are as guilty as any of that. I refer you to my comments on the incorrect statement about cumulativeness of bisphenol-A that was made by Professor Shaw. Ian Shaw I’m sure would be interested in hearing from you regarding his comments, you can find his details on the Canterbury University website – why not drop him a line? can you point out where he’s wrong in fact? Questions about the safety of some plastic bottles are finding few answers in this country, Chris Barton, of the NZ Herald, reports. Prof Ian Shaw doesn’t use cling film to wrap his sandwiches. [ Ron – if the article is on-line, there’s no need to cut’n’paste the whole thing. It’s kinder on readers to just post the link. (Readers not interested in it won’t have to wade their way past it.) Besides, I prefer to keep on the better side of copyright. Just for clarity, the items in square brackets in the previous comment are moderation edits, not Ronâ€™s words. “Small doses [of bisphenol-A] over a long time can initiate female hormone responses.” is absolutely wrong in fact, and I have explained why at length in the comments on an earlier article on bisphenol-A on Sciblogs. I’m not going to go through it all again. I refer you back to that article. Ian Shaw has also published two papers espousing his theory that methyl bromide (MeBr) causes amyotrophic lateral sclerosis (ALS). MeBr has been used widely around the world, including very careless use causing multiple cases of mild clinical toxicosis in some countries such as Turkey, and there is absolutely no international evidence for his theory. The fact that a tiny number of Nelson MeBr workers developed ALS is meaningless because correlation does NOT prove causation. ALS occurs in clusters in many places where MeBr is not used. Early last year he announced to the media that he had just discovered that MeBr reacts with glutathione. In fact this has been known for decades and has been in standard toxicology textbooks for years. He went on to say that he had a PhD student working on whether MeBr reacts with erythrocytes, and said that the results would be “crucial” to his theory of its toxicology. Again, it has been known for decades that MeBr reacts with erythrocytes. Furthermore , whether or not a xenobiotic reacts with erythrocytes does not dictate whether or not it is toxic. Offhand, I could name a number of deadly poisons that react with erythrocytes and some substances of low toxicity that do. A PhD is supposed to be original research, but finding that MeBr reacts with erythrocytes is not original research. As a Diplomate of the American Board of Toxicology (the premier qualification in toxicology) myself, who undertook her postdoctoral residency in toxicology with a distinguished toxicologist who is a former president of the Society of Toxicology, I often read Ian Shaws’s opinions next to those of Australian toxicologists in SMC’s “Experts Respond” and cringe with embarrassment, on behalf of New Zealand, at how poorly his commentaries compare to theirs. To a toxicologist such as myself, they come across as knowledgeable and he does not. Rosalind, can I assume you are referring to this blog? One of the fascinating thing with science is that even when one discusses issues with two experts such as Diplomates of the American Board of Toxicology (the premier qualification in toxicology) there are often two or more opinions expressed. Being an expert does not provide a mortgage on fact, fact or opinion. Professor Shaw has obviously come across as knowledgeable to someone of higher standing… After all he’s been promoted to a professorship by someone. I have a BSc (Hons) in Biochemistry from the University of Bath and a PhD in Biochemistry (Toxicology) from the University of Birmingham. My jobs have included the first lectureship in Toxicology in the UK at University College London where I worked on the toxicity of anticancer drugs. Then I moved to Boehringer Ingelheim (a pharmaceuticals company) to continue my anticancer drug work, but in a more clinical setting, then to the UK’s Central Veterinary Laboratory as Head of Toxicology Section where I was responsible for food analysis and research on toxic chemicals in food. Following this I was Chair in Toxicology at the University of Central Lancashire (UCLan) where I was also Head of the School of Biological Sciences and Head of the Centre for Toxicology. My work at UCLan focussed on pesticides, their measurement in food and their effects on consumers. During this time I chaired the UK government’s Pesticide Residues Committee. I moved to New Zealand in 2000 to take up leadership of the Food Safety Group at the Institute of Environmental Science & Research (ESR). From there I moved to the University of Canterbury as Pro Vice-Chancellor (Science) and in February 2009 reverted to the academic life as Professor of Toxicology in the Department of Chemistry. My research interests remain the mechanisms and impact of environmental chemicals on human health, but with a particular interest in chemicals that mimic hormones (endocrine disrupting chemicals â€“ EDCs). I am also passionate about science communication and have made TV programmes (e.g. Is it safe to eat? TVNZ, 2008), been on radio many times and write regularly for newspapers and magazines. Are you saying he’s unqualified to be viewed as an expert???? Rosalind, here is a quote from someone I presume has views similar to yours… I wonder if he missed maths 101, or if he was miss quoted. My point is that no one should accept uncritically what they read. â€œBPA is a very weak estrogen relative to the bodyâ€™s own estrogen called estradiol. Indeed some standard tests for estrogenicity fail to detect any estrogenic action of this chemical. It is estimated to be approximately 1/10,000th the potency of estradiol or in simple terms if one person makes 10,000 dollars/year someone else making 1/10,000th as much would receive 10.00 dollars/year. At present there is no credible evidence to suggest that contemporary exposures are linked with increased risk of breast cancer. I’m saying that on the basis of Prof Shaw’s comments on various issues in SMC’s “Experts Respond”, and his publications on MeBr and ALS, he comes across as credulous and lacking in critical acumen, and liable to be reach values-based rather than science-based conclusions. That may not be how he really thinks, but that’s how he comes across. In a couple of cases in which papers were reviewed by multiple experts in “Experts Respond”, the other ‘experts’ identified important limitations and caveats about research findings which Prof Shaw completely missed. As a result, he enthusiastically embraced conclusions that other ‘experts’ had strong, very well-grounded reservations about accepting. When I see an individual repeatedly miss important details that everyone else spots, I start to wonder why. I wonder about someone who claims to be a toxicologist yet never addresses the all-critical question of dose. I wonder about someone who doesn’t seem to know that correlation does not prove causation, and can’t seem to research the international evidence (or lack thereof) before claiming it does. I wonder about someone who announces a “new discovery” to the media when the finding has been in textbooks since the seventies, since doing a good literature search is such a basic research skill. It doesn’t add up to a good impression. As for what is safe to eat, I’d rely on John Reeve of NZFSA if I were you. He is a good toxicologist.